It is time to share what I sewed for myself during Selfish Sewing Week. As per usual I can really only sew on the weekends, so none of this was finished until yesterday. I did get a couple hours to sew during the week, but a serger mishap ate into some of that time. I completed three items, although two I had started sewing before SSW (long before!). But SSW actually inspired me to finish them, so that is a good thing! 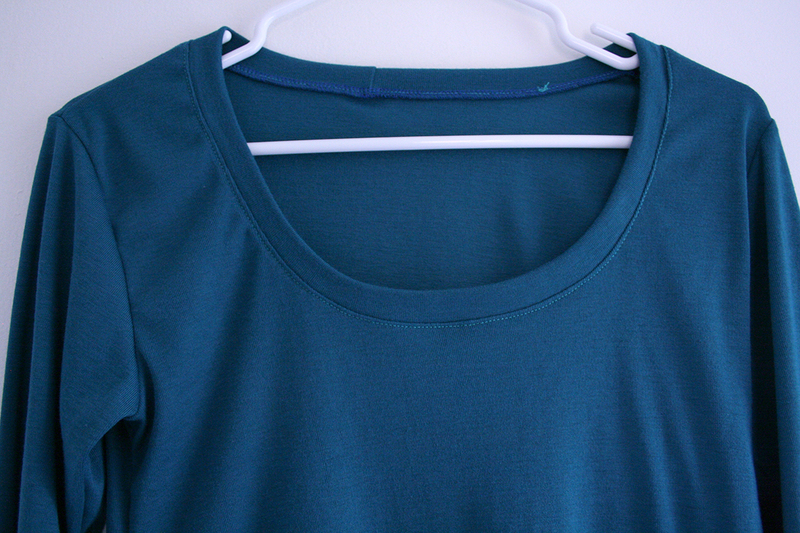 The scoop neckline on this top is perfect. Not so low that a tug from my two year old will create a wardrobe malfunction, just a flattering scoop to elongate the neck and create a nice open look. Here is the modeled shot. I don't really like to take pictures of myself and my hair wasn't washed and I was in a bit of a rush because the little guy was waking up from his nap, but here you go. You wanna know what the best thing about making tops for myself is? The sleeves are long enough! I'm a little taller than average so sleeves on most of my store-bought shirts end a couple inches above my wrists (especially after a few washings). 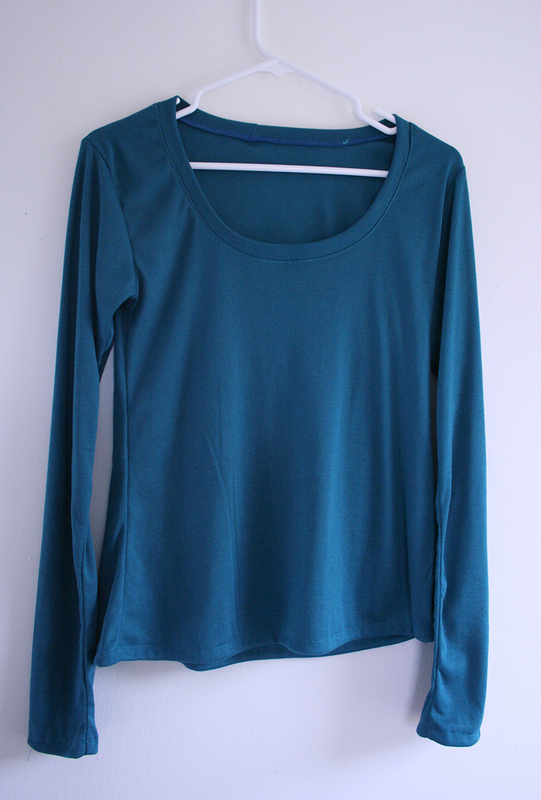 It is nice to be able to make shirts with true long sleeves. Next up is some work clothes. 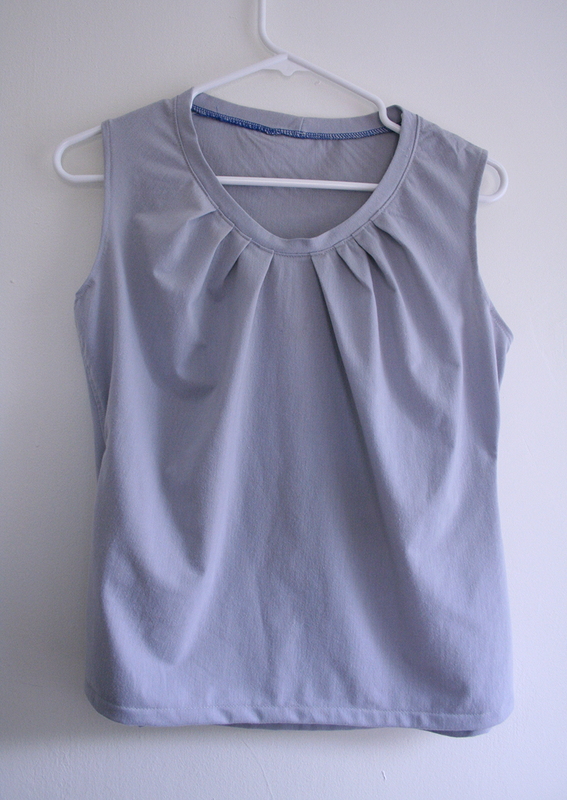 This shirt was made using a basic tee pattern that I have, that I cut and spread at the neckline to add pleats. I used a fabric that was left over from making my big kid a batman costume two years ago. Here's a closeup of the pleats. 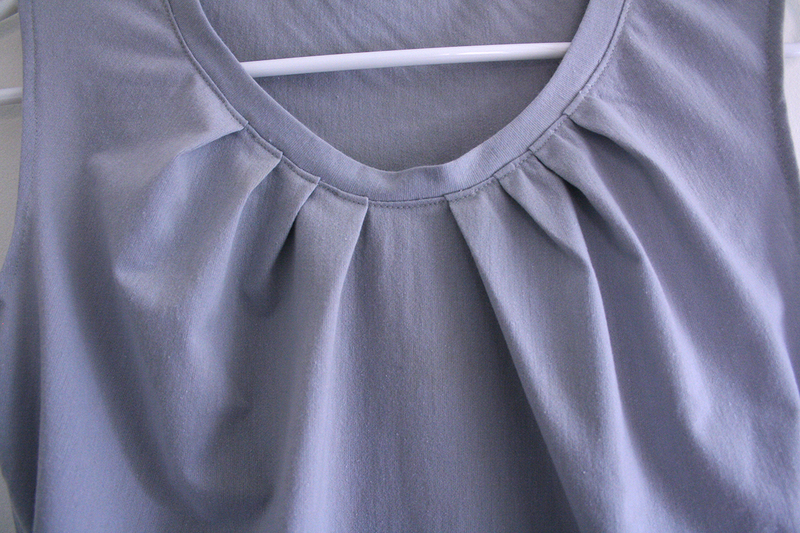 It might have been better to do the top-stitching on the neckband rather than below it. I also think it would have been better to make the shirt a little wider so the fabric could hang more freely from the pleats. As you'll see below the top is a little tight at the bust. Here is the top modeled with my third completed item. I am really proud of this one. It is a skirt I made using Melly Sews instructions for drafting your own skirt pattern out of a stretch suiting fabric. I had started this ages ago and then procrastinated about finishing it. I was a little intimidated by some aspects of the construction and didn't know quite how I wanted to finish it. I am glad Selfish Sewing Week gave me the incentive I needed to actually finish it. What I had at the beginning of the week was a two pattern piece skirt with darts, with the sides and back already sewn together and zipper inserted. I thought about adding a waistband but I couldn't figure out how to do that since the zipper was already in (without pulling out the seam ripper), so ultimately I decided to face it with a piece of the suiting fabric and then attach lining to the facing piece. 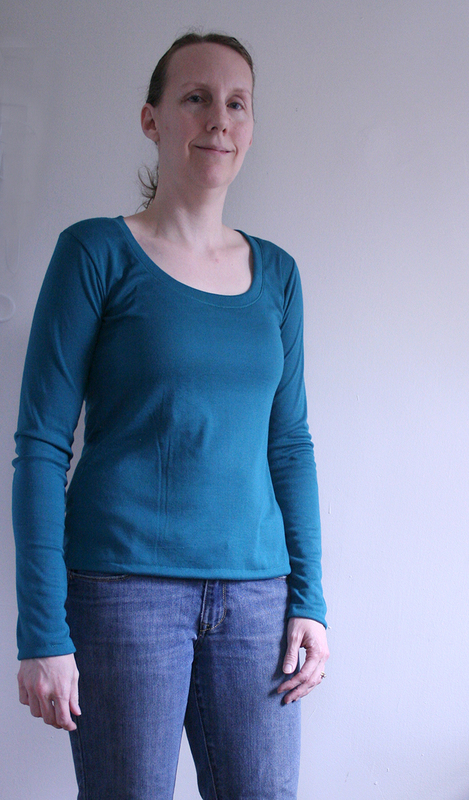 I probably could have made it a little tighter in the hips - especially since it is a stretch fabric. I am noticing in the pictures above that there seems to be extra fabric around the middle. Oh well -- it is comfortable. By the way, do you like my checking the Blackberry pose? You will see me doing that pose all day long at work. The skirt started off pretty plain, but when I tried it on yesterday I realized it was a little shorter than I like for a work skirt, so I decided to add a pleated ruffle at the bottom. Makes it a little more fun, but still very professional looking. I also did an exposed zipper in the back. I see a lot of exposed zippers these days, so I thought I would try it. It is pretty easy to do and, again, adds a little interest to the skirt. So that's what I got done during Selfish Sewing Week! Come back on Wednesday for a pattern tour featuring three lovely bloggers who have sewn up their own versions of my fox lovey pattern. One lucky reader will win a free copy of the fox lovey pattern! Ahh!! I love, love, love everything. That skirt and shirt combo is perfection. Great job. Thanks Lisa! I hope to get a lot of use out of everything. 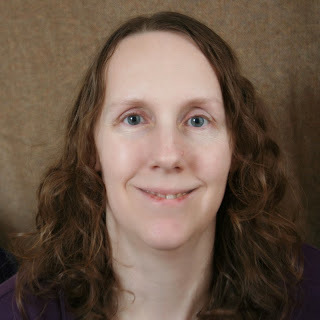 Found your blog through "We Did It Wednesday" and I must say I am glad I did. I love how you tackled a 'too short' skirt. Adding pleats at the bottom makes it look very professional. I will add this to my memory when I end up with that problem. Great Job! Thank you! 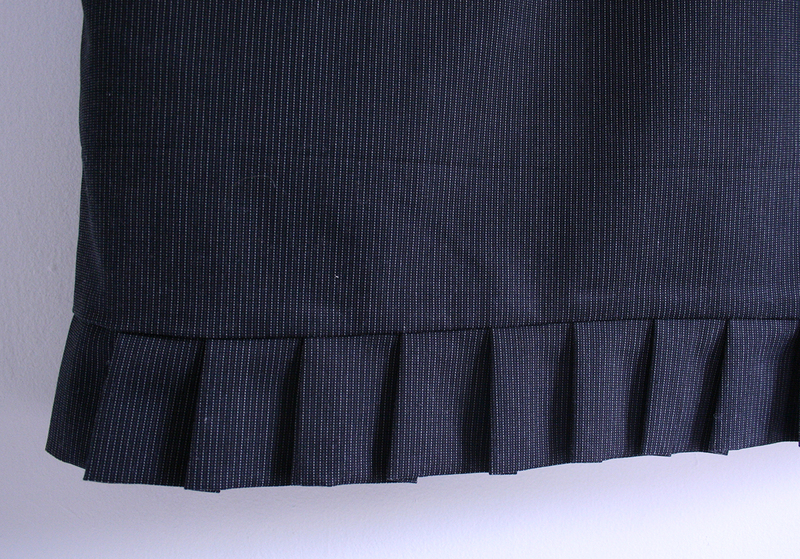 A bonus to adding the pleated ruffle at the bottom was that I didn't have to hem the skirt. I folded the fabric for the pleats in half so the bottom is the folded edge. Love your color choice! The pieces are beautiful and so easy to add to a wardrobe.